Four Steps to Avoid Accidents, Injuries and Liability. 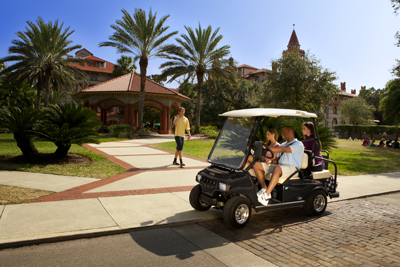 "The growth of retirement and gated communities, the rising cost of gasoline, and the emphasis on green technology are fueling this trend," says Geoff Stewart, director of safety for Club Car, the world's largest manufacturer of small-wheel, zero-emissions electric vehicles. Yet many users are unfamiliar with safety procedures and ordinances regarding these vehicles. Here are four steps you can take to prevent accidents and avoid liability. 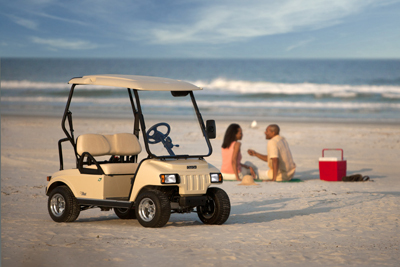 The term "golf car" is commonly used to refer to many different types of vehicles. Specifically, golf cars are vehicles for use on golf courses for the game of golf. When golf cars are used off the golf course, they are classified as Personal Transport Vehicles (PTVs). A PTV is a vehicle with a maximum speed of less than 20 mph that is for personal use. They may be powered by gasoline or electricity and driven on public roads as defined by state and local laws for purposes unrelated to golf. PTVs are not classified as motor vehicles under federal law and are not regulated by the NHTSA but by state and local governments. But another class of four-wheel vehicle known as a Low Speed Vehicle (LSV), or Neighborhood Electric Vehicle (NEV), is classified as a motor vehicle and regulated by the NHTSA. These vehicles travel at speeds between 20-25 mph. They are allowed on streets with speed limits of 35 mph or less in most states. But they must have vehicle identification numbers, be registered and insured, and be equipped with windshields, turn signals, head and tail lights, seat belts and other safety equipment. Here's the rub. Original manufacturers of golf cars keep the maximum speed below 15 mph. Yet owners sometimes have their vehicles modified to increase the speed. According to Fred Somers, secretary treasurer and legal counsel for the International Light Transportation Vehicle Association (ILTVA), an organization that regulates and promotes the safety of golf cars and other small four-wheel vehicles, this can have ramifications that many owners are unaware of. "If a golf car is modified to go 20-25 mph, it becomes by definition an LSV and is subject to the NHTSA requirements. In effect, many people are driving LSVs when they think they are driving golf cars," he says. "We often discover this after an accident," says Sgt. Brad Williams, supervisor of the traffic division of the Peachtree City, Ga., Police Department. "People then find that they're in violation of all kind of regulations." 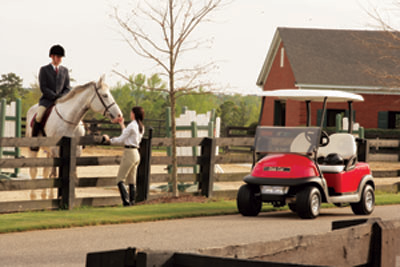 Peachtree City is a golf car community outside Atlanta with 9,000-10,000 registered golf cars and 90 miles of paths. State and local governments may decide the type of roadways on which PTVs and LSVs are allowed, what safety equipment is required, who can drive a PTV and many other factors. "This makes it very important to understand your state and local regulations," says Stewart. "The laws vary by jurisdiction." Betsy Tyler, public affairs director for Peachtree City, says they allow people as young as 12 to drive golf cars if a parent, grandparent or legal guardian is in the front seat. And all golf cars must be registered with the city. "But we are an old golf car community with somewhat lenient rules, some of which have been grandfathered. Just because something is legal in Peachtree City doesn't mean it's legal in another community - even one in Georgia. Know your local regulations," Tyler says. 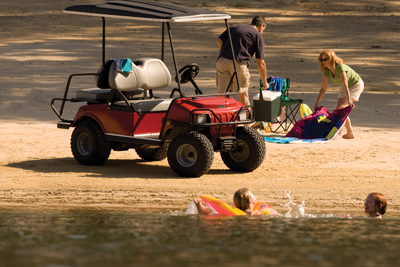 According to Williams, most golf car accidents in Peachtree City are just fender benders. "Speeding, driving too fast for conditions and underage driving are some of the biggest issues we face. A whopping 54% of golf car collisions in our area involve an operator 15 years of age or younger," he says. To help prevent accidents, Stewart recommends you familiarize yourself with the safety instructions on the vehicle and in your owner's manual and keep the following safety points in mind. Allow only licensed drivers, who are physically capable of driving your PTV, to operate your vehicle. "Make sure the driver understands all controls and operating procedures and knows and obeys local rules," he says. Operate the vehicles only from the driver's seat, and keep both hands on the wheel when the vehicle is in motion. Make sure all passengers are securely seated in the vehicle before you start it. Everyone in the vehicle should keep their entire body in the car when it is in motion and hold onto the handholds or handrails. To avoid falls, the driver and all passengers should remain seated until the vehicle comes to a complete stop. Only two passengers should be allowed on a bench seat, and no passengers should be allowed in the bag well of a vehicle. To avoid damage or injury, stop the vehicle before shifting the forward/reverse switch. "Reduce speed on wet grass, rough terrain or other adverse conditions. Use brakes to reduce speed when coasting downhill," Stewart advises. To prevent overturning the vehicle, drive slowly in turns and drive straight up and down slopes. "Avoid driving the vehicle on slopes exceeding 20 % inclines. It's also important to avoid sudden stops, starts and abrupt turns that can eject passengers." Stewart says. If you drive the vehicle after dark, make sure it's equipped with head and tail lights. Review the safety procedures in your manual with your children, and make sure they understand the dangers and possible consequences of not following them. Make sure your children meet the manufacturer's requirements for passengers and always supervise them while on the vehicle. "When children are in the vicinity of your vehicle, be sure to set the park brake, put the forward/reverse switch in neutral, turn the key to the off position and remove the key from the vehicle," Stewart says. "And keep the key in a secure location out of the reach of children and teens." Golf car insurance issues can also get confusing. "Many people insure their golf cars on their homeowners policy, but that may not be enough. Discuss liability insurance with your insurance agent," says Somers. "If you have an accident and don't have liability insurance, you're wide open to litigation. And don't let underage drivers operate your golf car. That also puts you at risk."